More than pipes, bongs, edibles, oils, dab rigs, or any other means of consumption, the joint remains an icon. It may be the only method that, when pantomimed, says to the rest of the world, "cannabis!" A joint is cheap, discreet, disposable, and easily shared among friends. It requires neither the financial investment of a bong nor the time commitment of an edible. But unless you've got nimble fingers or hours to spend practicing, it can be tough to learn how to twist one up. There's just one thing: A lot of people think they’re junk. "Out of maybe the 50 pre-rolls that I've got from dispensaries, two of them have been smokeable," lamented one cannabis-focused YouTuber. "The rest have just been disgusting. They've gone in the trash, they've gotten broken up, they've just not been smoked. It's pretty gross." He's not alone. 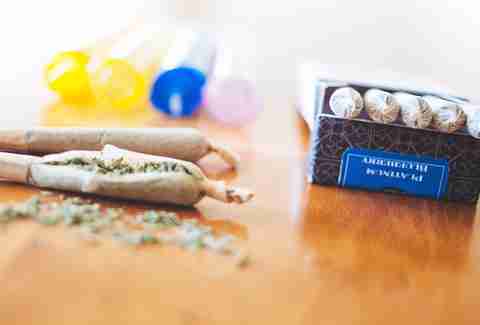 Many in the cannabis community steer clear of pre-rolled joints because of the perception that they contain low-quality cannabis. But where did that reputation come from? Is it deserved? And does it really mean pre-rolls aren't worth it? We spoke to budtenders, producers, dispensary owners, and cannabis enthusiasts to find out. The biggest takeaway? When it comes to pre-rolls, it's hard to generalize. But at least in some markets, they don't always deserve the bad rap. "The quality really varies a lot," said Lauren, who spent three years working in a Seattle medical dispensary and who requested anonymity in order to preserve her industry ties. While some producers use higher-quality flower, she said, others add what's called "trim" -- the leaves and stems that are cut away from the bud before curing. "A lot of the pre-rolls that are out there are made with a combination of plant material, and sometimes that includes smaller stems," she said. The biggest problem with a pre-roll is the paper, because it hides what's inside. That makes it easier for producers to get away with using subpar cannabis or trim. 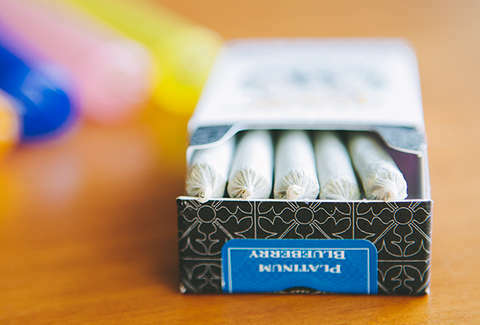 Even when a store includes high-quality cannabis, consumers still can't judge what's inside -- so the store may see little advantage in stocking high-quality pre-rolls. Here's how most pre-rolls are made: As budtenders in dispensaries shift nugs of cannabis in their jars, smaller bits of flower, known as "shake," fall off. "The jars get shifted all the time," explained Corey Schwartz, who manages Coast to Coast Collective in Los Angeles. "As you're dispensing to patients, they want certain buds. After a day or a half a day, that strain gets broken down." The shake gets collected for use in pre-rolls, which in Coast to Coast's case are rolled on-site. Coast to Coast and some other producers also add nugs themselves to their pre-roll mixtures. "When it comes to the nugs, we break them down and we actually grind them down in a grinder," Schwartz said. From there the mix is loaded into pre-rolled paper cones. A machine shakes the joints to help settle the mixture and remove air pockets. Once the joints are filled, an employee gently tamps down the contents of each one to make sure it's not too tight or too loose, which could cause it to burn poorly. With a twist of the tip, the pre-roll's ready to go. 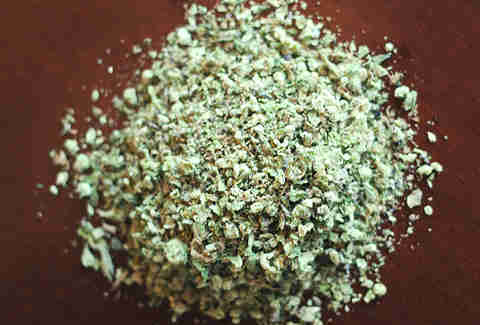 The use of shake is a widespread practice, and it ensures that all of a dispensary’s flower is put to use. But it can also ruffle feathers. Some consumers think shake is low-quality cannabis, which isn't necessarily the case. In essence, shake is just smaller pieces of the same-quality stuff. But there are caveats. Shake can be of low quality if it's dry -- usually the result of jars sitting out too long -- or if it contains stems and bits of leaves. And sometimes shake from various strains can be combined when making pre-rolls (sometimes called "mystery" or "rainbow" rolls). There's also a bigger problem: trim masquerading as shake. Before buying a bunch of pre-rolls, it's not a bad idea to sacrifice one and cut it open. The contents should look about the same as if you'd ground up a new nug. It's also OK to just ask your dispensary, and you should. "Our joints are always smaller nugs and shake that is broken down from the full pound," said Schwartz of Coast to Coast. "There's no less of a grade of a joint for us." In Washington, the recreational market has a different obstacle: There's not much shake at all. State laws force producers to pre-package nugs for consumers, so instead of collecting at the bottoms of jars like at medical dispensaries, anything that breaks off the bud stays sealed in the same bag the grower put it in. As such, recreational shops don't make their own pre-rolls, producers do. I turned to fellow Leafly employees to steer me toward good pre-rolls and bad ones in the Seattle area. The good producers came quickly: Solstice and Vashon Velvet. The bad ones were harder to nail down. Someone remembered a bad joint but couldn't say where it was sold or who made it. Out of curiosity I once cut open a pre-roll I got as a gift, and while it looked a little dusty, it was free of stems or other unwanted plant matter. Most people admitted they don't usually smoke pre-rolls anyway, in part because of their bad reputation. It's easy to find anecdotal evidence of bad pre-rolls, but frankly it was hard to find one on the spot. Without access to dispensary shake, Vashon Velvet makes pre-rolls from the same nugs it packages and sells… for the most part. The Vashon Island-based farm packages the prettiest ones -- the tops of the plants -- and then harvests lower buds to grind and roll into joints. "They're still good-quality cannabis, but they're not quite what we'd want to put in a bag to represent our stuff," said Vashon Velvet’s Patrick Rooney. The nugs are ground to a fine consistency and then screened to remove twigs and stems, he explained. "We select pretty carefully. I only put stuff into the joints that I would roll myself, you know?" The joints are individually inspected and packaged in boxes, then heat-sealed to help keep the cannabis fresh -- an important step, said Rooney. "I would totally compare it to coffee," he explained. "In the bean form, it's going to last longer than if you grind it. It's going to be a completely different coffee when it's ground." With more surface area in the ground-up cannabis, it will dry out and oxidize faster, leaving you with a harsher, less potent smoke. "There's a reason people are smoking joints from buds," he added. "It's a perfect vehicle for the flavor of the cannabis to come through." That said, great pre-rolled joints are out there; ask your cannabis-consuming friends for their local recommendations, or ask your budtender to recommend the freshest, most potent products they carry. If someone new to pre-rolls can't tell if the one in their hand is any good, Rooney said there are a few ways to check. "If you were to take a nice bud and put it through a grinder and dump it out, and then open up a pre-roll and dump it out, it should be the same," he advised. If you don't want to actually destroy your pre-roll, just pay attention when you smoke. If producers are adding trim to the mix, it's going to smell like campfire and taste "very planty," Rooney said. "It would definitely compromise quality immensely." This article was originally published as "What's in a Pre-Roll?" For this and more articles on cannabis news and culture, visit Leafly News.